Two Way Radios for Business – How Much Do They Cost? How much are business two way radios going to cost? This, of course, is always one of the first questions a Fire Chief, manager, or business owner is going to have when starting the research process for two way radios. The problem with answering this question is the fact that two way radios or walkie talkies have a number of options to choose from, and it can be very tough to know exactly what a two way radio will cost without speaking to an expert on the topic. Notwithstanding, we’ll do our best to give you some realistic price ranges as to what most people will spend. (Remember: these prices are AVERAGE, and can vary drastically depending on the product, the region, the company, etc). FRS radios are the model of radios you will find at Walmart or Canadian Tire. Family Radio System as the title would describe, should be used to keep track of you children at the park or beach, but we often find a number of businesses are using this FRS communications for day-to-day use. Our experience with these radios is that we get a number of customers each day that have had to replace these radios three to four times per year, and the communication is very unreliable, the equipment is not durable, costly, and they can be very unsafe because you may hear other people’s communications which can cause issues on your job sites. FRS radios do not require a Industry Canada License and there is no security. Commercial two way radios work great in businesses like hospitality, education, light construction, light manufacturing, property management and volunteer fire departments. These radios will allow for basic communications, but will not have the advanced features like digital frequency, waterproof rating, or IMPRES battery technology. Waterproof – Some radios are rated to be submersible in water. Digital – Many professional two way radios are able to work on MotoTRBO digital systems. Safety – Some professional radios have features like Man Down emergency button or CSA intrinsically safe. Industries like construction, manufacturing, gas and oil production and emergency services depend on professional radios to get the job done and keep their workforce safe. 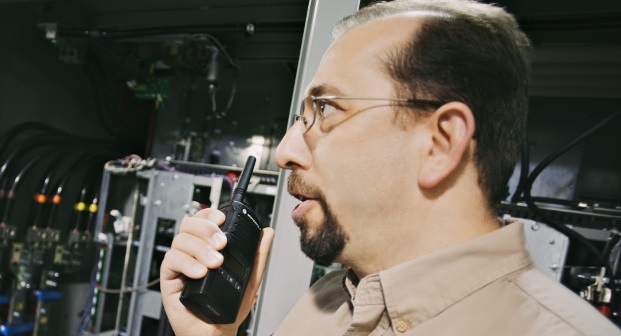 Mission critical radios are the top-of-the-line two way radios. Mission Critical radios are mostly used in public safety and government organizations. Mission Critical radios generally are or have the ability to work on P25 networks and wide area systems. Organizations like large city fire and police departments, as well as federal prisons and security agencies require the features of these radios because their communication is their life line to help if the situation calls. What radio is right for you? What condition are you working in? Light duty, medium duty or heavy duty environments? How hard will your staff be on the equipment? What issues are you looking to solve with radios? What is your budget to help with this purchase? As mentioned at the beginning of this article, you may need help with the specifics of the radios and matching the right radio to your application. Contact an expert in the two way radio business and they will help be your guide or start with the FREE Portable Radio Selection Guide below.